The hydraulic properties of an island’s aquifers were studied using a tidal response method. Groundwater is the principal water resource on the studied island, and the investigations of the aquifer for future groundwater development are ongoing. The method consists of three parts: observations of groundwater levels at paired near-shore and relatively inland sites affected by the same ocean tide, decompositions of the collected groundwater time series to yield isolated tidal components, and application of basic formulas describing propagation of groundwater-level oscillations in aquifers for determining hydraulic parameters. The observations require only auto-logging groundwater-level meters that are commonly used these days. Employed were two decomposition techniques that are easy to implement using only the built-in functions of spreadsheet software. Digital high-pass filtering was used to separate the tidal components of semidiurnal and diurnal periods from longer-period components prior to the following isolation of tidal constituents. Basic formulas for the Fourier transform were used to isolate one tidal constituent with a specific period. 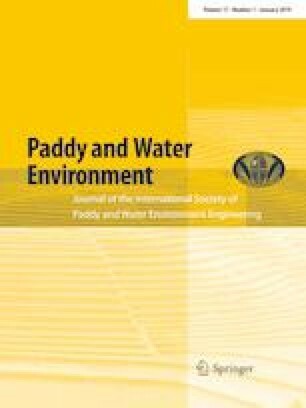 The isolation of one tidal constituent helps to reduce errors in the hydraulic parameter calculations based on formulas using the amplitude attenuation and phase shift of sinusoidal oscillations of the groundwater level. The calculation of aquifer hydraulic parameters can also be done directly on a spreadsheet. The derived aquifer hydraulic parameters compared well with those that were previously reported based on a pumping test conducted on the same island. The results are now used as a basis for further investigation of sustainable groundwater development on the island. The authors are grateful to the Land Improvement General Office and successive Officers for Policy Planning in the Land Improvement Division of the Okinawa General Bureau, Cabinet Office of Japan, for their support and collaboration. Thanks are also to local government officials and the residents of Tarama Island for their understanding and cooperation in the field study. This work was partially supported by JSPS KAKENHI Grant Number JP17K08011.